Welcome Monza & Monza Duo to the VEET/IPART Club! Two more of Aglo Systems’ downlights, Monza & Monza Duo, have received approvals under the VEET and IPART schemes. These schemes are designed to make energy efficiency improvements more affordable, contribute to the reduction of greenhouse gases, and encourage investment, employment and innovation in industries that supply energy efficiency goods and services. Monza is one of our chart-topping downlights, suiting most of the retail lighting environments. It’s crisp 160mmx155mm cut-out aids retrofit possibilities for large square cut-outs. The product features an extremely wide wattage range, extending from 13W to 50W. An equally interesting counterpart of Monza with two spot heads and a rectangular outer frame is Monza Duo. 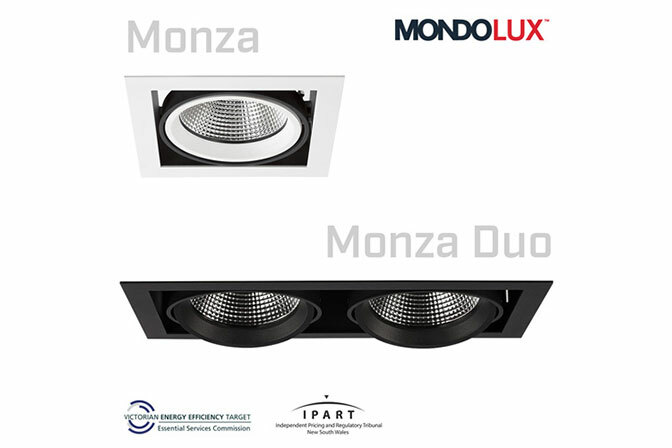 Monza Duo has a large rectangular cut-out of 320mmx155mm and is befitting for solutions that need powerful optics with pleasing aesthetics. Aglo Systems’ Lighting Efficiency Upgrades team is staying on course to build a good range of VEET&IPART approved products to suit varied applications. If you want our assistance on making selected energy efficiency improvements to your premises, or those of your business/organisation, give us a call today!